Billionaire Sebastian Pinera took a smaller-than-expected lead in the first round of voting in Chile’s presidential election Sunday, throwing his victory in next month’s run-off into doubt and likely dealing a blow to this year’s rally in stocks. The opposition leader and former president has 36. 7 percent of the vote with 97. 8 percent of ballots counted, the electoral service said on its website Sunday. Alejandro Guillier of the ruling, center-left coalition, has 22. 7 percent, while Beatriz Sanchez, head of the newly created Frente Amplio alliance, beat expectations with 20. Guillier will now face Pinera in a run-off Dec.
Pinera didn’t hold back on the promises during his campaign. Growth will accelerate, poverty will tumble and thousands of new “quality” jobs will be created, he pledged. At the same time, the state will cut corporate taxes, improve pensions and maintain free higher education for most students. Much of that will be financed by $7 billion in savings, which, he says, won’t lead to firings. His manifesto helped push stocks to record highs, yet failed to convince the electorate. “The immense majority of analysts were sure Pinera would win in the second round; now we are not taking that for granted,” said Cristobal Bellolio, professor at the Universidad Adolfo Ibanez School of Government. “What appeared to be a done deal is now 50/50. ” Pinera’s vote tally compares with the 44. 4 percent support he had in the latest survey by the Centro de Estudios Publicos. Sanchez more than doubled the 8. 5 percent she had in the same survey. Stock Rally The benchmark IPSA index has rallied as much as 20 percent since Pinera announced his plans to run in the election on March 21 amid hopes tax cuts would revive investment, growth and corporate profits. Juan Andres Camus, president of the Santiago Stock Exchange, has warned that if Pinera loses “the probability that we have a collapse in share prices is high. ” Still, we are not there yet. Guillier must now try to persuade everyone on the center-left to unify around his campaign. That includes supporters of Sanchez, Carolina Goic, a Christian Democrat who won 5. 9 percent, and the independent Marco Enriquez-Ominami, who has 5. While Enriquez-Ominami immediately pledged his support, Sanchez and Goic have yet to make an announcement. “All the candidates now need to go out and get votes,” Bellolio said. What looked like a boring election now looks like a real fight. 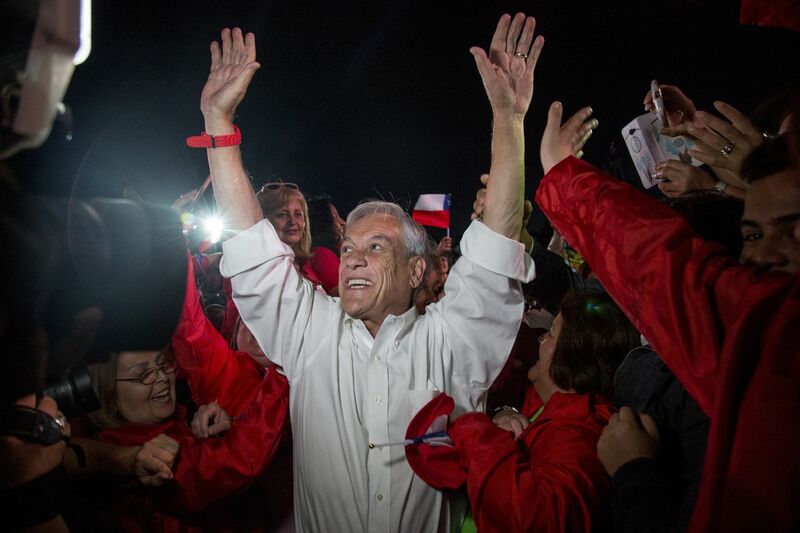 ” Key Player It is Sanchez and the Frente Amplio who will be decisive, said Kenneth Bunker, director of the electoral program at Universidad Central. “Frente Amplio has the key to the second round,” Bunker said. “No-one knows who will win. Guillier maybe has more possibilities. ” Pinera put a brave face on the night, calling it a great result and highlighting the fact he won in all the regions of the country. Still, his vote fell far short of expectations after he failed to capitalize on voter discontent with the current government. Chile’s economy has posted the slowest four years of growth since the early 1980s after copper prices collapsed and President Michelle Bachelet raised taxes and ratcheted up state spending on health and education. Many in the business community blame her policies for declining investment, a sentiment Pinera had tried to tap into. “I am prepared to pull the country out of the bog into which it has sunk, put it back on its feet and set it going,” Pinera said last month. Guillier has pledged to build on the reforms of Bachelet, expanding free higher education to more students, devolving power to the regions and carrying out “major surgery” on the system of private pension funds and health care. Copper Rally While stocks have rallied on the prospect of a Pinera victory, the bond market has been largely indifferent to the outcome. Peso-denominated notes returned 17 percent under his previous government from 2010 to 2014, compared with 6. Yet, that owed more to the copper cycle than to Pinera’s policies, said Pablo Goldberg, an emerging-market portfolio manager at BlackRock. Now, with copper prices rallying again, the outlook for Chile’s economy is looking up, no matter who wins. Pinera is so confident that he can turn things around that he resuscitated an old forecast -- that Chile will soon reach developed nation status, this time by 2025. Back in 2007, during Bachelet’s first administration, then Finance Minister Andres Velasco said the country could pass that threshold by 2020, catching up with Portugal in terms of per capita income. Three years later, Pinera was even more ambitious, putting the year at 2018. Neither of them were correct. “Our goal is that by the year 2025, Chile is the first country in Latin America to overcome under-development,” Pinera said last month. Sunday’s result means that economic landmark may not depend on him.